The Old Vicarage is a 150 year old former Victorian rectory, this impressive silver-granite building is a family run licensed AA four-star Guest House, offering a warm welcome to guests for over 45 years. Quality en-suite accommodation with parking and award winning breakfasts. There are no rooms available at Old Vicarage for these dates. Pets: Pets are allowed at a charge of £6.00 per day. Excellent. Very friendly owner and delightful old house. Breakfast was outstanding. We have been staying at the Old Vicarage for the past 31 years. It has kept its wonderful old world charm through all that time. 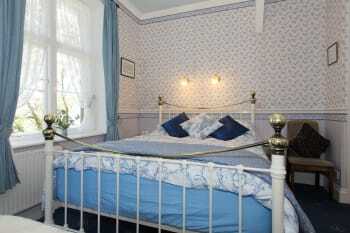 The bedrooms are lovely and warm and very comfortable and the traditional Cornish breakfast is excellent. Our hosts always make us feel very special and welcome and getting away to the Old Vicarage is one of our yearly treats. Fantastic B&B! Very friendly hosts, characterful house, easy parking, easy to walk into town, amazing breakfasts! Would definitely stay here again. Really enjoyed our stay st the Old Vicarage! A lovely place where we were able to relax despite a family funeral. Great service, a lovely room and wonderful breakfast. The only thing I would say is that you’re not easy to find on google which means you may be loosing out on new business. (Which is a real shame as fabulous stay!) might be worth looking at how to raise your profile/join booking.com or similar. Would definitely recommend to friends and family and have done already! It was very plesant stay for two nights. Very quiet and cozy. The breakfast was excellent, and the staffs are friendly and helpful. We forgot one personal stuff in our room but it was kindly sent to us by post immediately. It has been delivered. Thank you for providing a very good service. It took 15 minutes to go to the centre of St. Ives and 20 minutes to come back to tge hotel on foot, and it was a bit steep. But it was perfect for us to do a little excercise especially after a big dinner. Just wandering around St Ives is a pleasure. It has a beautiful harbour and quaint shops. There are also lots of other towns and villages in a close vicinity to drive to or you can hop on a bus tour. We loved the lodgings: a historic building with period furnishings (and the coolest historic toilet), beautiful grounds right next to the walking path, and delicious breakfasts with local ingredients and plenty of options for vegetarians. We loved this place. It's wonderful to come upon it so unexpectedly; the building and garden are marvellous, there's a help-yourself bar and sitting room downstairs, and the breakfast was absolutely great. It's not the cheabest B&B we've stayed in, but may be the one with the best value for money. You can walk down to the beaches and restaurants of St. Ives in about 20-30 minutes (depending on the beach); even better, you can also easily go out into the fields and reach the coastal path in about 20 minutes. Such a friendly welcome and relaxed surroundings. Breakfast was the best I've ever tasted at a B&B. Thoroughly enjoyed our stay. Very old fashioned and quaint bedroom with perhaps a bit too many clashing patterns for some, reminded me of sleeping at my nans as a child, which wasn't a bad memory, far from it, but may not be to everyone's taste. Access to St Ives a walk down the hill, plenty of taxis waiting to bring you bavk at the end of the night if you dont fancy the 20ish min walk, reasonably priced and regular too. Excellent breakfast menu with a good variety of healthy choices. Room very clean, well equipped and beds comfortable. Quiet location. All staff most welcoming and pleasant, and Martin most helpful in cleaning our car after a visit from some gulls.!!! Our fourth visit. Thank you for a great stay. Fish Restaurant, but book. Porthmear Beach Restaurant-book for evening. Yellow Canary or St. Ives Bakery for Cornish pasties. Tate Modern. A lovely old house with a nice room, a well equiped bar and delicious breakfast in the morning. Diane welcomed us and showed us evrything. We felt very welcome. The Loft restaurant was our favorite! And Pels cafe for pancakes, both near the Harbour. Minack theatre was amazing! 1st class accommodation very welcoming hospitality. Breakfast choice and quality very high standard. Good bus service for short journey to and from town. Taxis from town inexpensive and plentiful. Lots of diverse restaurants in the town to choose from. Beautiful home that is spotlessly clean.. Good variety of food at breakfast. Missed having Peter to look after our breakfast needs when we moved to other locations in Cornwall. Thank you for making our stay so enjoyable. You really feel comfortable in a nice old warm house. I was allowed to charge my hybrid car - excellent! This was a friendly, clean and comfortable B and B. The food was good with special diets taken into consideration. A 15 minute walk to the beach may be too much for some but a cheap taxi service sorted this problem. Free parking was a special added bonus. There was nothing that I could fault with our room or the service we received. Without doubt this is one of the best B&B's. This was our third stay and as usual we were warmly welcomed by Dianne and Martin, the proprietors. The premises and the grounds are absolutely beautiful and provide a wonderful back drop to a great holiday. The staff are very friendly and do a great job! The atmosphere is so special that it really does feel like home. All respect for Dianne and Martin who do a great job here - a true example of excellent hospitality. Note: The breakfasts are second to none!! We love this part of Cornwall to go exploring and we would recommend that you buy a good travel guide to make the most of your holiday. Thanks Loki (and Martin) for washing the car. It looks great. Good luck Loki on earning enough money to go to Tanzania with your classmates. We appreciated the suggestions for meals and the ride into town so we wouldn't be late for the Porthminster Beach Cafe reservation. Not having a reliable internet was frustrating but I understand that Martin is resolving that problem. The reading lights were great in the bedroom. Thanks for that. I appreciated the bar and the honor system. This B&B is a 20 minute downhill walk to the center of town and a beautiful beach. The B&B is peaceful. The breakfast offered both hot and cold dishes and the choices were ample. The hosts were friendly and helpful. The proprietors were very welcoming and accommodating. The rectory building itself has great character and is located in a lovely setting. There was a good breakfast selection; the full Cornish was amazing, and included the nicest white pudding I have ever tasted (reason enough to come back!). Can't say enough concerning the warmth and friendliness of our hosts, Martin and Dianne, and their staff especially Peter. If we ever return to Cornwall, there is no question that we will place ourselves in their capable hands again! Excellent hosts, wonderful rooms and facilities (lounge and bar) and excellent breakfasts. Tate Modern is within walking distance. Lots of galleries and restaurants a bit further on in town. We absolutely loved our stay at the Old Vicarage. Diane and Peter took excellent care of us. Looking forward to returning. The Market Place had the best cream tea and scones and make sure to take the walking tour with Dawn that begins at the Guildhall - she was wonderful! I enjoyed my stay. It was a good distance from the center of St Ives if you enjoy walking. It was great to be able to bring my dog also. Breakfast was very nice- I enjoyed the fresh fruits and yoghurt in particular. The owner was able to recommend a great pub nearby for dinner. I would stay there if I was in St Ives again. 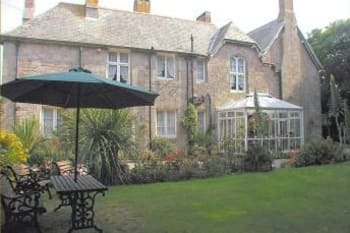 Friendly welcome, lovely private gardens, delicious food, wonderfully comfy beds - we come back as often as we can. St Just - Bookshop Café - a second hand bookshop over a café that serves the best food and has the friendliest of staff. We always visit to look at the medieval wall paintings in St Just church too. Old well kept house. Rooms and bathrooms spotlessly clean and decorated in sympathy with age of house. House kept very warm. Lovely garden. Excellent breakfast, homemade granola first class and Cornish breakfast made to order. Taxi into harbour only £6. A wonderful stay ... warm welcome, invaluable local information, luxurious bed, and a breakfast spread that meant we didn't have to eat for the rest of the day! This was our German visitors' first experience of B&B in the UK ... they are more than ready for more. Thank you. Beautiful old building, kept in style. Rooms excellent, great lounge and honesty bar, extensive breakfast choice. Old Vicarage is about 15 minutes out of town up hill so not so convenient for frequent trips into town but on the plus side has plenty of parking. Bernard Leach pottery museum and studio is just round the corner. Habour View hotel great for afternoon tea. Porthminster gallery has wonderful but pricey artwork. A lovely little hotel, full of charm and personality. Staff could not be more helpful and welcoming. Situated just a couple of minutes walk from the Leach Pottery studio and museum. Maybe one of the best houses in Great Britain! Wonderful house with kindly staff. May not be the easiest place to find, first time. Very quiet and peaceful location. Breakfast is an absolute treat. The staff was lovely and helpful and the Old Vicarage is absolutely charming! Brilliant stay and staff were lovely. Wonderful place! Amazingly clean, fabulous breakfast and really comfortable beds...what more could one ask? Location if great as there is off street parking (gold dust in St. ives) and a reliable bus service that runs from the rugby club around the corner to the Tate gallery. Lovely traditional hotel/B&B. High quality furnishings. Amazing breakfast including fresh fruit. Good parking & easy access to the beaches & town. Best to park your car & use the bus or taxi but St Ives is really a walking destination. Plenty of good restaurants. Bus service goes straight to the Tate! Dianne and Martin were so welcoming and helpful, they clearly love their home and grounds. Peter was super attentive at breakfast. We felt at home from the minute we arrived which was great. We were in Room 5 with views over the garden, we loved the décor and really beautiful bedding, plenty of wardrobe and drawer space. The bathroom was well equipped with toiletries and the blue and white Victorian toilet was so unusual. The breakfasts and packed lunches were excellent. We were only here for 3 nights but would have stayed longer and hope to return in the future. Cliff top walks are lovely. The Seafood café in St Ives is well worth a visit, there is an excellent range of fresh fish as well as pork, chicken or steak. A visit to the Barbara Hepworth Museum and Gardens is a must. If you are able to time your visit to a guided 'tour' then do so it brings everything to life. This is a small garden but so much to see and very tranquil. If you want a good beach with plenty of space for all try Carbis Bay a short drive or train journey away. The Eden Project is about 90 mins away, expensive for a family and a long day particularly for the old or young - Take a packed lunch. The Lost Gardens of Heligan is supposed to be brilliant but we didn't have time to visit. The Old Vicarage is a fair walk uphill from the town. The walk into town is pleasant but do take a taxi (£5) or bus (£2) back - we did walk back once, it is steeper than you think and our legs ached for days! Couldn't have we been hg as power we both our stay! The staff was helpful, food wonderful and setting perfect. The Breakfast was extremely good, with a wide choice of breakfast options. The homemade yogurt & fish cakes were very good indeed. The history of the old vicarage was interesting, it was decorated in keeping with a house that age. St Ives is a lovely place. Nice small shops , & the galleries are good to see the talent of the local artists. In particular, The Tate, Barbara Hepworth museum & the Bernard Leach pottery are good to visit for those who are interested in art. 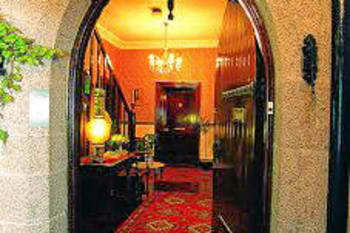 Great value in a cosy, spotless building with charming and helpful hosts. St Ives easy to be in, local buses from near to the hotel and returns up to 10.30 pm. Plenty of cafes restaurants but booking a little ahead I'd advised in busy times as walk-ins can be difficult. We had a fanstastic stay at old vicarage. Comfortable beds and Beautiful charming old house with possibility to use the bar and living room, were there were games the Children could play with. The breakfast has a lot to offer and really generous and friendly staff and owners. We loved the beach café and also other restaurants with fish and seafood. Also the Leach pottery is really closeby and is interesting, were chidren also can make their own vase. The tate gallery has a nice view of the beach from the café. A quiet and cozy place to relax after a busy day at the beach, shopping, and gallery-hopping in St. Ives. The building is beautiful. The staff was very friendly and accommodating. The breakfasts were excellent. We had a lovely stay. The Southwest Coast Trail is a beautiful walk. We had the best sunset dinner at the Porthmeor Cafe, across from the Tate Museum. We loved skipping the taxi and taking the invigorating walk back from town up to the Vicarage. Charming accommodation in a beautiful garden setting. Very friendly and helpful staff. Spacious comfortable room with lots of little extra touches such as the heated towel rail in the bathroom and the biscuits which were a welcome touch to have with a cup of tea, to name just a couple. One of the best breakfasts I have experienced. Allow plenty of time to explore the surrounding countryside, the cobbled streets and Tate St Ives, or sample one of the local Cornish pasties while enjoying the view over the bay. Make sure to ride the scenic train between St Ives and St Erth....more than once. It's awesome! Close to coastal path. Good parking. Good food at Halsetown Inn. The host and hostess are very welcoming and friendly people. Breakfasts superb The little honour bar...excellent The room and antiques throughout the building are very fitting to the age and style of the vicarage We loved the place! The Old Vicarage was such a quaint place to stay. The house was beautiful and so nicely decorated. Our room was so comfortable - it felt like home. Thank you for such a peaceful place to stay. Perfect location, great hosts, fantastic breakfasts and easy access to St Ives. Loads of amazing recommendations in the information book - the trick is fitting everything in! Very friendly and nice staff, clean and beautiful rooms. Excellent breakfast. I had a very happy time in this b&b and I'd recommend it to other travellers. The place is only 10-15 walking distance from the city centre. The area is very safe and it's possible to get to city centre also during night by walking. Don't be put off by the hill back up to the Old Vicarage...if taken slowly it's not so bad! We really enjoyed our stay at the Old Vicarage; the owners were extremely friendly and helpful and the location is ideal for exploring all of St Ives. The rooms are light and airy and the standard of cleanliness is second to none; my wife remarked 'this is the cleanest room I've ever stayed in'! Very nice Hotel and very friendly staff! Good location for trips to Lands End, Scilly Isles and Cornwall Atlantik coast. Really delicious breakfast, very friendly homely feel. Comfortable beds! Lots to see and do in St Ives, bit of a long steep walk back up the hill, but there are taxis outside the cinema if you're feeling lazy! Lovely warm and friendly reception on arrival by Dianne. Grand old building, full of interesting features with large, private parking area. Grand breakfast room in which were served a good choice of breakfasts - very tasty too! Bedroom was clean, tidy and comfortable. Walk along the rugged Cornish coast to spot seals, birds of prey and then back to the beautiful sandy beaches with turquoise waves rolling in. Go back in time walking through the old town and have a drink beside the harbor. We particularly liked the Seafood Cafe for evening dinner. Great short stay. A beautiful house, a real home from home. Lovely welcome, superb breakfast, we will certainly stay here again on our next visit. As we arrived in St Ives earlier than anticipated we parked at Lelant Saltlands and caught the train into town. Lovely views right along the coast, not having to drive into town was also a bonus! Ate at "The Seafood Cafe" which was excellent. Walked part of the coastal path, quite a challenging section but stunning scenery. Lovely Edwardian ambience but with modern facilities.....a lovely place to stay with a great commodious bedroom room and also a lovely lounge and dining room. The breakfasts are excellent with a great choice and the service friendly and efficient. Certainly a place to re-visit and enjoy. My main tip is there is so much to see and so much to enjoy at all levels you will love every minute. Dianne and staff helpful, friendly, unobtrusive but there if needed. They make you feel welcome. The breakfasts are wonderful and a good choice of menu. The house itself is very interesting with attention to detail. Fair walk into centre of St Ives but steep walk back. 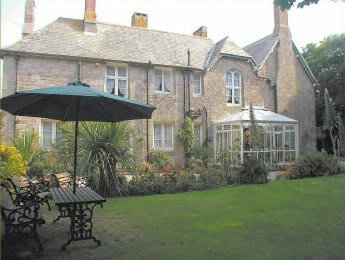 Old Vicarage is a good location for driving to and parking, which is a plus for the location as it is difficult to drive and park in the centre of St Ives. Location good for driving out to other areas. St Ives itself has plenty to see and do with many places to eat. excellent b b will come again . food great. rooms nice.what more do you want. Beautiful rooms and an exciting house. Very welcoming and relaxed feeling--we were made to feel at home. Excellent cooked breakfast--wide choice and very well cooked. Rooms spotless and beds very comfortable. 4 for location due to long walk uphill from the town, otherwise quiet area and pleasant garden. E-mail communication prior to arrival helpful and very thoughtful. We enjoyed two meals at The Queen--Sunday lunch being very good. Also enjoyed a meal at the restaurent on the sea front at Porthmeor beach where they were especially good with young children. Service and food very good at both venues. Booking ahead is worth doing, and is essential at the Fish Cafe. Pleasant and atmospheric place to stay. Homemade food was delicious. Only fault was hot tap in my sink didn't work (I used the kettle) - other than that small thing - splendid. Great location if you like a bit of peace from the buzz of the main town . Very near the Leach pottery and a short stroll to the sea front. Very nice and clan. Owners extremely kind and helpful. Higly recommended! Delightful. The owners were friendly and extremely helpful. We were delighted with The Old Vicarage. A quiet location with space to sit outside in tree lined gardens. Ample parking space allowing freedom to leave your car behind and so not have to battle for parking in St Ives centre. All rooms were clean and tidy, the staff friendly, helpful and available. The breakfast was magnificent with a wide choice available to suit all, set you up for the day. The location is about 15 to 20 minutes walk down hill into St Ives, but there is ample local transport e.g bus from the Rugby club 200 metres away (£1) also local taxis available at reasonable prices. Do the walking if your able. There are many local restaurants to visit, depends on your taste. Would recommend Blas Burger normally a first come first served small restaurant specialising in great burgers, brill. For something special Porthminster Kitchen, excellent food and service with good views over the harbour. Lots to choose fromin St Ives, for large parties 6 and over suggest do your homework and try and book a few weeks before you travel. Great choices for breakfast. Wonderful fruit. The Alba was a great choice for dinner on the harbour in St. Ives. Reservations are a must. An authentic country pub is Gurnard's Head. Good choice. A very friendly welcome and relaxing few days in a beautiful well kept old house. 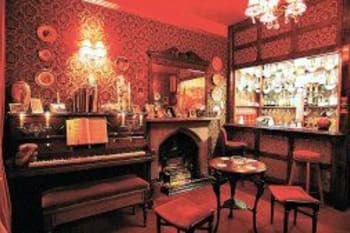 The victorian decor and gardens are clean and well kept and the honesty bar was a welcome surprise. The full breakfast was of high quality and the service excellent. Would not hesitate to recommend or book again. Our room was spacious and clean and we enjoyed the generous and tasty breakfasts. The location was a bit of a walk from town, but it allowed for excellent parking and a quiet place to stay. We did not mind the walk as it was scenic and allowed us to walk our dinner off in the evening! Be prepared for a bit of a walk into town and to the beach area. It is fairly steep. but is a nice bit of exercise if you like a walk. Also, it is a fairly cheap cab ride if you don't want to walk. Lovely building and really nice hosts. One of the best breakfasts ever! Walking distance to the main town.